Vol. 1, no. 1 (Feb. 1872)-v. 13, no. 13 (May 15, 1885). The Daily Nebraskan, the independent student newspaper at the University of Nebraska-Lincoln (UNL), was founded in 1871. Because it is a student newspaper, it uniquely views major events through the lens of university life. Upon its founding, the newspaper now nicknamed "the DN" was first called the Monthly Hesperian Student and published by the Palladian Literary Society, a student group. It ran eight pages with one full page of small, black and white ads in each issue. Its first editor was W. L. Sweet. The staff created six sections: editorial, literary, alumni, athletic, exchange, and local. The paper's earliest content reflected late nineteenth-century concerns with personal conduct; for example, the first issue's front page offered guidance about morality, wise choices, and education's true purpose. 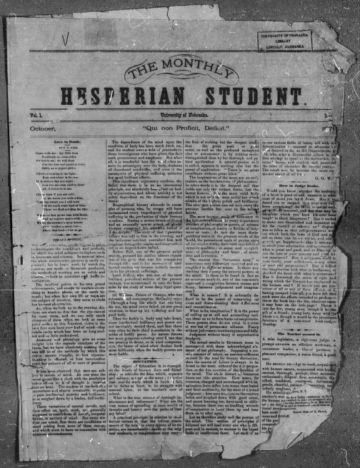 From 1885 to 1899, the name Monthly Hesperian Student was shortened to the Hesperian. The Nebraskan began in 1892 under Frank T. "Rag" Riley's leadership.1 In 1899, the papers formed The Nebraskan-Hesperian and in 1901 the paper was renamed the Daily Nebraskan. The new century saw the paper with a new name, the application of modern journalistic methods, and a new look. The 1905 Daily Nebraskan returned to a four-column format and its masthead was capitalized in large block letters. One copy of the daily paper cost $0.05, and semester and year subscriptions were $1 and $2, respectively. The focus turned to news reporting from the more literary pursuits of the late 1800s, and the paper's coverage reflected pivotal events through the student perspective. Even though called "Daily", the paper varied its publication schedule throughout the years, sometimes running Sunday, Tuesday-Friday, and usually publishing just one day a week during the summer. When Europe began fighting World War I in 1914, the staff published Chancellor Samuel Avery's remarks urging students to respect President Woodrow Wilson's neutrality policy.3 Neither World War I nor the Depression, much later, interrupted regular publication. During World War II, however, publication scaled back to three days a week, and toward the war's end the paper became vocal on race issues. In 1942 managing editor Paul Svoboda criticized UNL's racial policy in an opinion piece. He thought that the requirement that Japanese students be cleared by the FBI before attending classes was part of the "great American paradox" of equality.4 Throughout the coming decades the Daily Nebraskan would continue to reflect and comment on society. In 1952 amid anti-Communist feelings, history professor E. N. Anderson was investigated for using the textbook The State of Asia containing material by Owen Lattimore (a prominent historian and Chinese sympathizer). Editor Ruth Raymond called it ridiculous.5 Ten years later, fear of nuclear attacks prompted 41 buildings on campus to be designated as "tentative fallout shelters in the event of an emergency" with the cooperation of the Department of Defense. Much social unrest was palpable during these years. In December 1963, an associate professor of sociology discussed the Kennedy assassination at a lecture on the campus. By the mid-1970s social turmoil was so pervasive that the paper's content reflected it even in its choice of ads. For example, an ad appeared in 1976 for a university lecture by the chief prosecutor in the Manson "Family" murders. Also, that same year's presidential election was covered, with the staff noting that in spite of Carter's victory "Nebraska voted solidly for Ford." Many editorials and news articles focused on the Vietnam War, and the paper reported UNL's own student protest at the Military and Naval Sciences Building in April 1970, which was a response to the Kent State shootings.6 Other student protests nationwide were also covered. The paper's appearance and content continued to shift; by this time a daily crossword puzzle, along with sections dedicated to arts and entertainment and sports, were fixtures. The paper's masthead was lowercased and put into a trendy typeface, actually shaded blue. By 1985, changed page design allowed for many full-page ads in the paper. This indicated the period's economic prosperity and young adults' consumerism. For example, an ad for American Express credit cards targeted UNL's class of '85: "before you graduate, you could be using the American Express card." The staff created a special section, "the Sower," dedicated to profiling notable Nebraskans; this brought the paper to 16 pages. During the '90s, the motto "covering the University of Nebraska–Lincoln since 1901" appeared beneath the masthead—a reference to its final naming and possibly what students saw as the start of modernity. The end of the '90s was marked by the headline "Despite Fears, New Year Enters Quietly" on an article discussing the irrationality of "Y2K" uncertainties. The Daily Nebraskan began online publication in 1995. 1 Robert E. Knoll, Prairie University: A history of the University of Nebraska (Lincoln: University of Nebraska Press, 1995), 93.